From the second law of thermodynamics, the concept of a refrigerator and a heat pump can be described. In concept both refrigerators and heat pumps follow a very similar schematic as a heat engine, except instead they are used to transfer heat from one environment to another environment. Refrigerators are devices that that will transfer heat from a low temperature environment to a high temperature environment. Now, as stated in the previous article, heat will only flow from a hotter environment to a colder environment. Which initially makes it seem like the concept of a refrigerator breaks the second law of thermodynamics. However, work can be used to transfer heat from the colder environment to a warmer environment. 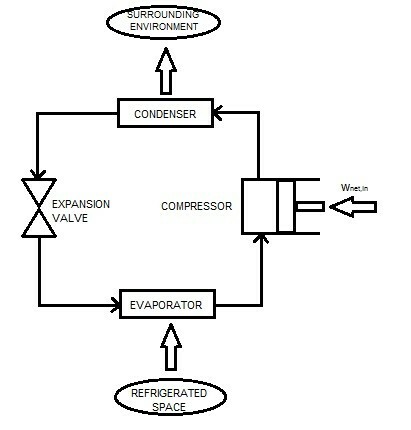 Below a basic diagram of a refrigerator can be seen. From the diagram it can be seen that a refrigerator consist of four basic components. 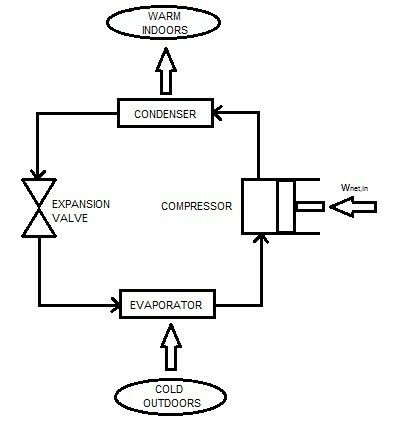 These are a compressor, a condenser, an expansion valve (also known as a throttling valve), and an evaporator. Work is input into the compressor to compress the refrigerant to a high pressure as it enters the condenser, which is the network of tubes seen on the back of the refrigerator. While the refrigerant is being compressed to a high pressure, the temperature also increases to a higher temperature then the environment outside of the refrigerator, which in turn will cause the outside environment to act like a sink. After the refrigerant has gone through the condenser it will reach the expansion valve. The expansion valve will cause the pressure and temperature of the refrigerant to drop drastically. The temperature of the refrigerant will now be lower than the environment inside refrigerator. The cooled refrigerant will than enter the evaporator, which is a series of tubes inside of the refrigerator. As the refrigerant flows through the evaporator, the refrigerators environment will act like a source and heat will be transferred into the refrigerator causing it to evaporate. The refrigerant, which is now a gas, will enter the compressor again, where it will be compressed back into a liquid at a high pressure and temperature, and the process will repeat. So essentially, using work to run the compressor, the outside environment can be transformed into a sink where the refrigerant will dump waste heat, while the environment inside the refrigerator will become a source where heat will be transferred into the refrigerant. This all happens because of the process described in the previous paragraph. To see how well a refrigerator is performing the coefficient of performance can be calculated by using equation 1. The coefficient of performance represents the amount of heat removed in comparison to work in, and the higher the number the better that refrigerator is performing. This number can be greater than 1, which means that this number doesn’t represent the efficiency of the refrigerator and should not be confused with efficiency. A heat pump is very similar to a refrigerator except instead of removing heat from an inside environment and transferring it to an outside environment, it removes heat from an outside environment and transfers it to an inside environment, such as the inside of you a house. The same cycle that is used for a refrigerator is used for a heat pump except it operates in reverse. Refer to the diagram below. Like refrigerators, a heat pump also has a coefficient of performance to show how well it is performing. The coefficient of performance for a heat pump can be calculated using equation 2. For a heat pump the coefficient of performance will always be greater than one. In cases that the outside environment very cold than the COP can drop below one. If that happens the heat pump would switch to resistance heating to heat the inside environment. Finally, the coefficient of performance for a heat pump can also be related to the coefficient of performance of a refrigerator by using equation 3. The coefficient of performance can also be related to U.S. energy efficiency rating (EER) through equation 4. Finally, since a heat pump is a reversed refrigerator it can also be used as an air-conditioner by reversing its cycle. For air-conditioners the coefficient of performance can also be related to U.S. energy efficiency rating (EER) through equation 4. Typically, the EER would between 8 and 12, and the COP would be between 2.3 and 3.5 for most air conditioners. The Clausius Statement is a formal definition of how refrigerators and heat pumps relate to the 2nd law. This statement basically is saying that work must be put into a device such as a compressor to allow heat to transfer from a lower-temperature to a higher-temperature environment.